I thought the magazine might inspire my fleish-adverse eight-year-old to give meat another chance, but he didn’t find the machete-wielding gals as beguiling as I did. 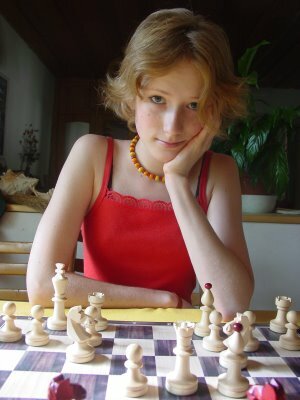 Anna Rudolf, recent cheating-smear victim (as depicted on Susan Polgar’s blog). I am back blogging, after a long holiday break. The pattern of these nebulous accusations is often the same, as in Toiletgate and Toddlergate: a successful player is accused of going to the bathroom too often and having physical or wireless access to a chess-playing computer. In Rudolf’s case, suspicion centered on her lip balm, which was said to be a wireless device for communicating with a remote silicon adviser. To her chagrin, the organizers confiscated her handbag and lip balm before the key round. Her opponent refused to shake her hand before the game and told her she didn’t play fair. Her concentration was rattled and she ultimately blew the game. The Web site Chessdom has an interview with Rudolf and continuing coverage of the nonsense. It is now too common in chess for disgruntled losers to raise the specter of cheating without offering a shred of evidence. False allegations, which are maliciously made in order to hurt a player’s reputation and confidence, are as much a threat to tournament chess as are real cases of hidden microcomputers and surreptitious wireless devices. The problem is that FIDE, the international chess federation, has let the false accusers run amok.